This statistic presents the estimated change in Medicaid enrollment and expenditures, by 2019. 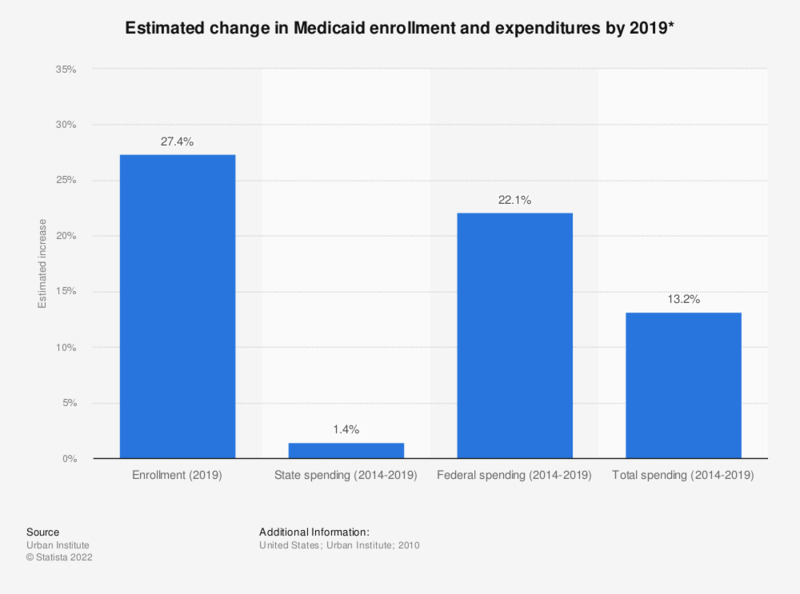 Medicaid enrollment is estimated to increase 27.4 percent and total Medicaid spending is projected to increase 13.2 percent between the period 2014 to 2019. Data are based on the "limited outreach scenario" which assumes that the economic challenges facing states will slow their ability to implement changes and promote participation in Medicaid. These assumptions are thought to be generally consistent with those made by the Congressional Budget Office in their national estimates of the legislation’s impact. * Baseline: Estimates of what Medicaid spending and enrollment would have been (by 2019) without the health reform law.